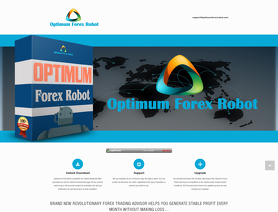 The OptimumForexRobot MT4 EA is a forex expert advisor. The Optimum Forex Robot automated forex trading software for the MetaTrader platform has been forward tested by Forex Peace Army. The OptimumForexRobot.com forex robot places trades for you. I bought a copy of Optimum Binary Robot this week and ran it. It wiped my account out is less than 24 hours. The drawdown was so great that I was getting emails from my broker to put more money into my account. I would advise anyone not to buy this robot. I will start by saying the customer service is horrible. I'm lucky I even received the software as well as Activation it took them nearly 3-4 days before answer my emails. And now I want to connect to a live account and I have been trying to reach them for around 5-6 days with nothing as a response. I'm pretty sure the product sold to me is most likely just a rewrote version of someone else's hard work.. scammers stay away!!!! These sellers are not serious.. I bought the product and waited for more than 5 days and no Expert Advisor. I asked for money back, as the promise it for 30 days, but get no answer since next 5 days! I only bought it because of the 30days money back guarantee ! So beware as they are the typical scammers. @forexpeacearmy. Please better check for such scammers, when showed as review. I bought the product and waited for more than 1 day for activation. I made immediately a 99.9% back test and the account crashed after 9 days, because it is Martingale. I asked for money back, as the promise it for 30 days, but get no answer since 5 days!